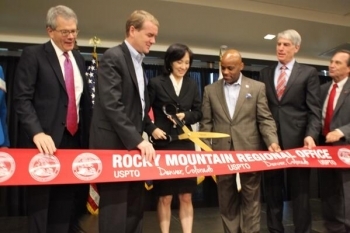 Today Acting U.S. Deputy Secretary of Commerce Bruce Andrews and Deputy Under Secretary of Commerce for Intellectual Property and Deputy Director of the USPTO Michelle K. Lee opened the permanent location for the USPTO Rocky Mountain Regional Office in in Denver’s central business district to help the region’s entrepreneurs advance cutting-edge ideas to the marketplace, grow their businesses, and more efficiently navigate the world’s strongest intellectual property system. Through the ‘Open for Business Agenda,’ the Commerce Department is actively investing in communities across the country to build their capacity to spur innovation. They strongly support innovative startups and enterprises throughout their lifecycle because those companies produce economic growth, support good-paying jobs, and benefit America’s middle class. The Department also believes that this new USPTO satellite office will help the Rocky Mountain region’s inventors and entrepreneurs speed up their innovative products and technologies into the marketplace. The U.S. Patent and Trademark Office hopes that by retaining and hiring more talented examiners locally they can further improve the overall quality and transparency of their operations while continuing to reduce patent pendency on a national scale. The new Rocky Mountain Regional Satellite Office is expected to create an estimated 130 high-quality, good-paying jobs, that will eventually house patent examiners, Patent Trial and Appeal Board (PTAB) judges, and outreach officials in a 45,000-square-foot space located in the Byron G. Rogers Federal Building.